The average true range (ATR) was introduced by Welles Wilder in his book, “New Concepts in Technical Trading Systems.” This indicator applies the ATR as a trailing stop and includes a modified version suggested by Sylvain Vervoort in his article “Average True Range Trailing Stops” (Stocks & Commodities V. 27:6 (34-40)). An average of this value is then calculated, creating the Average True Range. Of course, NinjaTrader has a predefined ATR indicator (ATR (period)). However, by using a specific formula, an ATR value based on a different input than the close, for example an average price calculation, can be applied. Because the ATR responds to volatility, the indicator will highlight possible trend changes and may therefore also be used for stop and reverse systems. 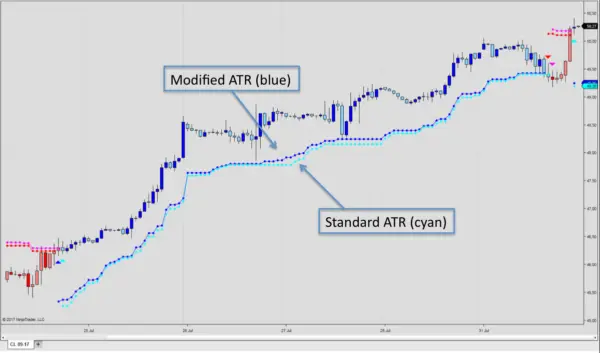 However, the ATR trailing stop is primarily suitable for defining exits, not entries. When using the ATR average as a measure for stop loss purposes, you’ll want to use a multiplication factor. We’ve set the default value to 3.5 as it allows us to accommodate more volatile instruments. Regarding the modified ATR trailing stop introduced by Vervoort, it limits the extreme price change of a single bar to a maximum of 1.5 the ATR moving average of the high minus low prices. Also, because the absolute value of the current high minus the previous close may be distorted by a large gap between the previous high and current low, Vervoort limits their influence by taking into account just half the size of the gap. Because the absolute value of the current low minus the previous close may also be distorted by large gaps between the previous low and the current high, only half of the size of such gaps are taken into account. As for the price difference between the current high and low value, if the price stays within 1.5 times the ATR moving average, the modified formula will calculate the difference between the high and low. However, if the current value of the high price minus the low move beyond 1.5 of the ATR moving average, the formula will limit the value to 1.5 times the moving average of the current high minus low price. The modified ATR therefore responds to extended periods of high-volatility, whereas high-volatility events, such as news releases, will only affect the stop level to a moderate degree. We could only detect a minor difference between the standard ATR calculation, and the modified ATR version suggested by Vervoort. The LizardIndicators ATR trailing stop indicator has the option to activate the modified ATR calculation and the multiplication factor can be set according to your risk preference via the dialogue box. The ATR trailing stop indicator applies a trend logic, where the paint-pars display blue colors during an uptrend, and red during a downtrend. By setting the indicator to reverse intrabar, the indicator will factor high and low levels that occur intrabar, instead of waiting to see whether the close of the bar breaks above or below the stop line.